9:30 Leave Hartley Bay Marina travel west three km to Wanapitei Bay. 10:00 Paddle south west five km, on Wanapitei Bay Reaching the French River Main Outlet. 11:00 Paddle five km to the Elbow, turn west paddle two km to Dales rapid. 1:00 Paddle back east two km to the Elbow; continue to Moosehorn Bay than through Whales mouth one km. 1:45 Enter French River Eastern Outlet travel north four km to Ox Bay. 2:30 Paddle north through Tug Channel and Canoe Bay Channel, two km. 3:00 Head north paddle five km to Hartley Bay. 4:30 Arrive back at Marina, depart. 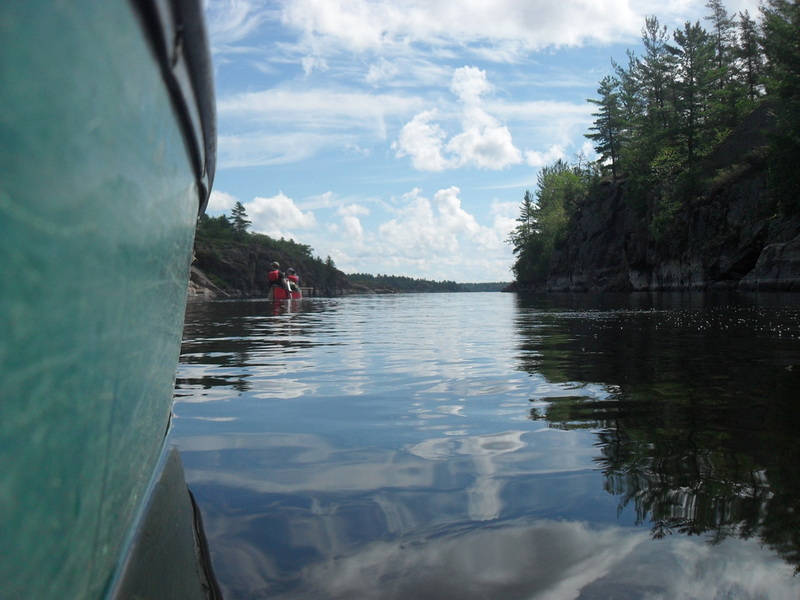 On this one day tour we will explore a couple of the channels known as the Eastern and Main Channels of the French River. As we wander the many inlets beneath the vertical walls and windswept pine trees one experiences what it must have been like for the first travellers of these waterways. The highlight of the tour is our stop at Dalles Rapids a scenic vista of the dramatic drop of the French River as it makes its way to Georgian Bay. Some relics of times past still lay in the waters here partially submerged and a reminder of the rivers busy past. Here you will have the chance to relax a little have lunch, swim or just take in the beauty of this unique place. We will then make our way back by squeezing our way through Whales Mouth and north up the Eastern Channel. During the tour one may notice a variety of wildlife from birds including a diverse group of song birds, water fowl and shore birds, making this an excellent opportunity for the avid birder. Many other creatures also make the French River their home some common and not so common sights such as foxes, bears, moose, rabbits, porcupines, and deer to name a few may also be spotted here. 10:30 Leave Hartley Bay Marina travel three km to Wanapitei river east mouth. 11:30 Follow river three km to “The Forks” turn north to “Sturgeon Chutes”, two km. 12:00 Lunch, swim at Sturgeon Chutes. 1:00 Pack up, head south two km, follow west mouth of Wanapitei river south four km. 2:00 Head East on the Western Channel five km, turning north through tug channel and canoe bay channel one km. 3:00 Back through Hartley Bay five km. 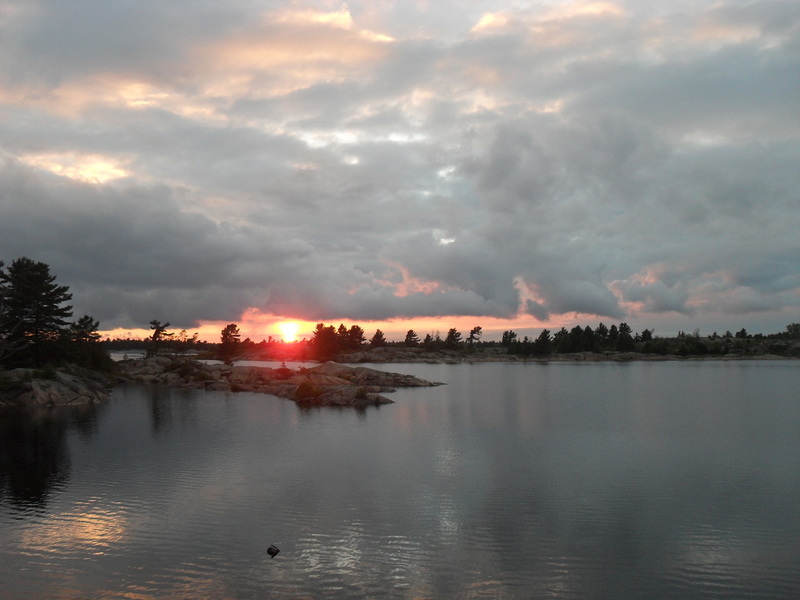 On this one day tour we will circumnavigate Boom Island at the upper north of the French River. This tour highlights the dramatic effects of a river environment and also shows a striking change in tree foliage as one paddles north where the deciduous type trees change to the typical windblown French River pines. Exposed rugged glaciated rock outcrops can be viewed and is a central feature at the Sturgeon Chutes were the rocks twist and turn and the water cascades over these picturesque features. Being a river environment many song birds and other species of birds are found along its banks. Red-eyed Vireos and Blackburnian Warblers are among some of the species as well, Bald Eagles, Sand Hill Cranes and Great Blue Herons. Many animals such as the iconic beaver, river otter, red fox, moose and elk have also been spotted along the shores and are just some of the wildlife you may spot on your tour.